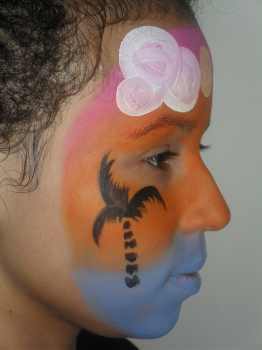 The coolest tropical island face painting ideas are here for you to look at also get some free face painting ideas. I'm sure I don't have to tell you how much FUN kids have with these kind of toddler activities. 1. To start with paint a base coat. The top third of the face should be a pink and themiddle orange. Then the bottom third of the face should be blue as in the picture. Next Then blend the edges of the three colors in together. 2. Now using a white paint create two clouds on the forehead. Create your clouds by using a thick paint brush. Just paint large circles and overlap them to get a good cloud effect. 3. Next using a bright yellow paint create the sun between the clouds. 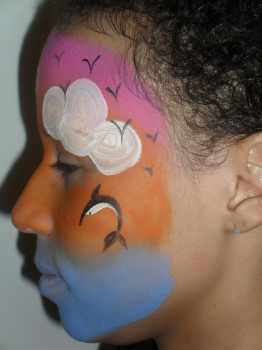 Again just use a thick paint brush and paint a circle and fill in. 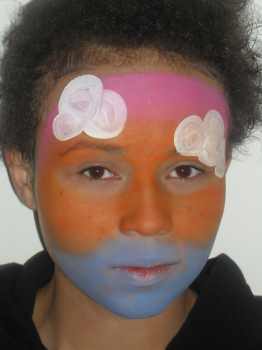 Now use a light black or gey to paint some seagulls at the top of the forehead. 4. Next using black create a palm tree on one cheek. Try and paint one like this in small sections. Using a fine brush will help with small items like this. 5. Finally using black and white paint create a dolphin image on the other cheek. Again using the fine brush you used for the palmtree. 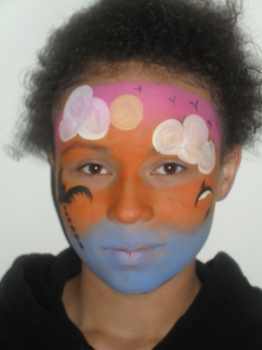 You can print of a tropical island face painting template here as a pdf. It saves having to print the whole of this webpage. 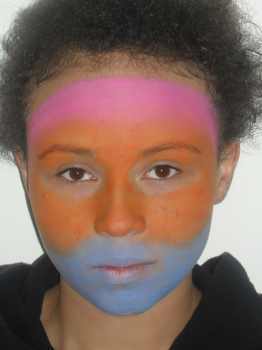 If your looking for more face painting ideas then this video below shows you how to face paint a tropical island.